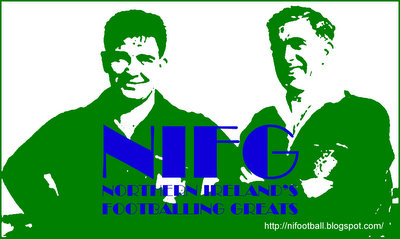 Ireland: 1 Full Cap (1935), 1 Amateur Cap (1935); Irish League: 2 Caps (1935). The youngest of nine brothers Cecil Allan was orphaned by the time he was seven-years-old. His mother died when he was four and his English-born father, who had worked on the Titanic, was killed as an innocent passer-by in the centre of Belfast during a gun battle between the IRA and the "Black and Tans". Allan played with Linfield Swifts before making the firstteam with Cliftonville where he developed into one of the most promising young defenders in the Irish League. At the time Cliftonville were an amateur side, and the young Allan followed in his father’s footsteps by becoming an apprentice at Harland & Wolff. 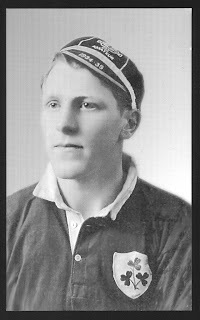 Allan made his full international début in October 1935, against England at Windsor Park. As an amateur he could not receive payment for the appearance, but the £10 left for him at a Belfast jewellers was used to buy a ring with the IFA badge and match details inscribed on it. During that same season he picked up Inter-League honours, most notably in a 2-1 victory over the Football League at Bloomfield Road, Blackpool. Shortly afterwards he was snapped up by Chelsea, but on his debut for the reserves he damaged his cartilage and never made the first XI. His movement still restricted by the cartilage operation, which also left him with 22 stitches on his leg, Allan moved on to Southern League side Colchester United for the princely sum of £2,000 in 1938, and made a total of 16 first-team appearances spanning the Second World War. On leaving Colchester in 1946 he signed for Colchester Casuals as captain and coach, where future Newcastle forward Vic Keeble and West Ham defender John Bond began their careers. Married to a local woman, who was an accomplished swimmer and diver to Olympic standard, Allan settled in the area and returned to his sheet metal work roots. He also kept himself busy as manager of the works football team and pianist with the works dance band. Cecil Allan passed away in his sleep, at the age of 88, in May 2003. Additional information and picture supplied by George Glass.